28. 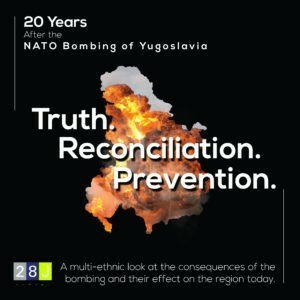 Jun will mark the 20th anniversary of the NATO bombing of Yugoslavia with a new project which will explore the consequences of the bombing at the United Nations. 28. Jun will utilize its Special Consultative Status to chair two special sessions at the UN in New York and Geneva dealing with the effects on the region through a multi-ethnic lens. Titled ‘Truth. Reconciliation. Prevention.’— the endeavor seeks the support of the international community in bringing lasting stability to the Western Balkans through honest discourse. Last week, 28. Jun Vice President Milo Dubak delivered a blistering speech at the United Nations strongly condemning the illegal bombing at the 40th Session of the Human Rights Council. He concluded by announcing the organization’s plan to undertake the ambitious project which is slated to span several months.